Most of my homepage is written in Hebrew, promoting my practice as a couple counselor in Israel, using my knowledge in Evolutionary Psychology theory and my expertise in human verbal and non-verbal communication. The pages in the English language are aimed mostly at professional animal behaviorists. The "Animal Signals" pages are here with them in mind, and are mostly dedicated for studies and explanations of Amplifiers and Indices. The Preface provides some historical and personal background to my correspondence with the late John Maynard Smith, initiated by him, before he and David Harper wrote their book "Animal Signals". The second topic here is my discovery of a bait-fishing crow. Although professional behaviorists may find delight in my video of "Bait-fishing crows" (see also link on the left), that page also attracts many other animal lovers. 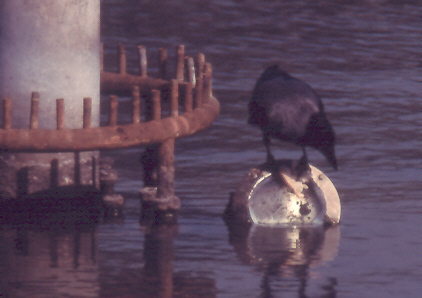 This is where they can see something they cannot see even on the National Geographic or on the Discovery Channels: a crow using bread for bait-fishing. I find posting a personal page here, a little odd, but it is probably the right thing to do. At least as a courtesy to my friends and colleagues around the globe who have wondered what has happened to me, and why I have shown no sign of scientific activity during the past few years. The short answer is that I am alive, healthy and well, thank you. The medium-size story goes along with a short history: I graduated in 1987 from the University of Arizona, The Department of Ecology and Evolutionary Biology, where I first introduced the concept of Amplifiers (amplifying signals), with genetic models and possible examples to back it up. In 1990 I received a tenure-track position as an ecologist in the Department of Entomology, Faculty of Agriculture, The Hebrew University of Jerusalem. I could easily teach general and population ecology, given my studies at the EEB of the U of A. However, what shows best my frustration in that department was the fact that during my last year there, students of one of my classes (general ecology, 200 students), ranked my course above 95% of courses in their program, whereas students of another class (insect ecology, 30 students) ranked this course above 8% of the courses. The first course was built as a show, aimed for the students' general knowledge and taught main ecological and evolutionary principles, the second was a higher level theoretical course. Only a few students in that program matched the level of students in regular biological programs in major universities in Israel, and my second course was aimed to meet their needs (in previous years, others usually dropped the class). In contrast with my experience in vertebrate research, particularly in ornithology, I had little experience in entomology – besides raising, in jars, as a child, every invertebrate I could put my hand on in Tel Aviv’s backyards. However, knowing that universities in Israel are financial wrecks, which means that positions in my field are very scarce, I took the first tenure-track position that had been offered to me. I had little interest in applied entomology, and had a lot of interest in basic research, in particular animal communication, which I continued doing both theoretically and empirically, alongside some applied research, during my tenure-track position at the Faculty of Agriculture. I usually find most joy in combining theoretical and empirical studies in my research, and this is what I did. Being in a department of entomology, where birds are usually too large to be seen, it became almost natural for me to study jumping spiders. They are the most visually-driven, and hence the most bird-like communicators I could find among land invertebrates. I also had good memories from the time I collected them off my walls, and observed them hunting flies in jars when I was a kid. During my tenure-track position I received nice grants, the biggest one was to study jumping spiders with Dave Clark, a jumping spiders specialist from Alma college, Michigan. For this research, we also invited another jumping spider specialist, Phil Taylor, as a postdoc, to work with me in my laboratory. I was hoping we would have the time for more conclusive results, but nevertheless, John Maynard Smith chose this study, on the dark triangular mark in the abdomen of the male jumping spider, Plexippus paykulli, to be a major example for an honest signal that is not a handicap, in his and Harper’s important book, “Animal Signals”. However, the other implication of this study was, as it later turned out, that a few faculty members in my very small applied department did not like the fact that I have committed myself, through this grant, to doing basic research. Eventually, they managed to ban my tenure. I therefore left my academic position in 1997. At the time, I was reluctant to leave Israel for a long period of time just for any position, given that my youngest son was still young and that his mother lives in Israel (now, spring 2010, he's 24, completing his 4th y as a graduate student at the University of Pennsylvania). Since then I got a nice scholarship for studying screenplay writing (don't ask! I didn't ask for it but enjoyed this offer tremendously) in one of the best film schools in Israel , published two children's books, worked a few years in a program of education for excellent students, and had teaching positions at four academic institutes out of the major six in Israel (at the Hebrew University of Jerusalem: Department of Communication and Journalism; Haifa University: The Institute of Evolution; Bar Ilan University: the Department of Psychology, and in the Technion: The Faculty of Biology). This covers the medium-sized story, explaining my absence in doing scientific research. Practicing Evolutionary Psychology: In the meantime, I have become increasingly interested in Evolutionary Psychology, and used my knowledge in animal communication and my experience in theoretical thinking for making interesting inferences on human inter-personal communication. Indeed, one of the academic courses I have been teaching for many years, at three universities, is entitled “The Evolution of Interpersonal Communication”. Recently, after gaining enough confidence in my understanding of human behavior, through special questionnaires I designed, which were filled by about a thousand students and couples, married as well as unmarried, by reading current Evolutionary Psychology papers, by making, with the help of my students, surveys of dating sites, and through workshops I gave on interpersonal communication and body language, I started practicing evolutionary theory as a marriage consultant, working with couples on their conflicts in life strategies, and on their communication problems. This is an extremely interesting topic, rewarding both intellectually and emotionally. Furthermore, the practice seems to be very successful. For several years I have been running a successful open forum on the internet, as an online help to people with problems in love, communication and relationships, using evolutionary ideas about human needs, strategies and communication theory (and no, I don't need to be explicit about this: after all, they need help, not an intellectual stimulation). As it appears, many surfers made it a habit to visit this forum just to read my answers (at least in Hebrew, I have my way with words). Oddly enough, after not receiving tenure for not doing enough applied research, it turned out this is precisely what I am doing now: using scientific knowledge for applied purposes. However, practicing evolutionary psychology is far more interesting to me than doing pest control. Back to doing research: On October 2006, Lewi Stone, a professor of biomathematics, invited me to lead a theoretical research on female extra-pair copulations in socially monogamous mating systems. After some hesitation, thinking of ways to optimize money, carrier progress and desire, I decided to take this offer, part time, without compromising my other jobs. In retrospect, it has, in part, and lasted 3 full years. This period also produced two papers on female infidelity in monogamous systems, and another unrelated one, my first in evolutionary psychology, on the evolution of emotional tears (see list of publications). It has also revived my appetite for scientific research.